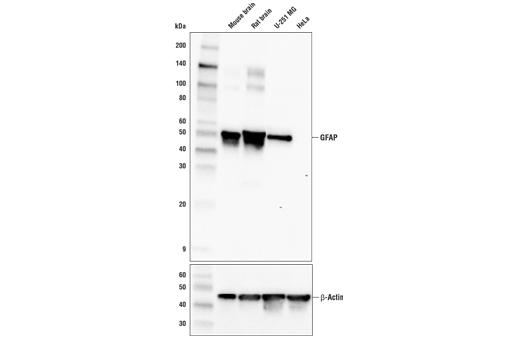 Western blot analysis of extracts from various tissues and cell lines using GFAP (E4L7M) XP® Rabbit mAb and β-Actin (D6A8) Rabbit mAb #8457 (lower). 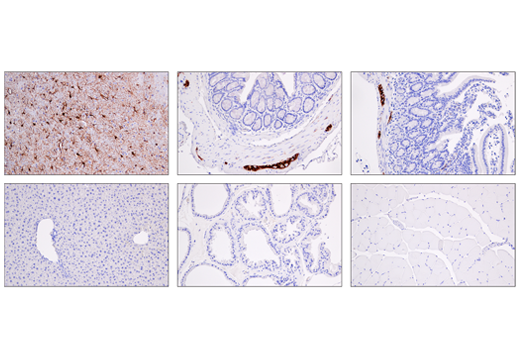 Immunohistochemical analysis of various paraffin-embedded normal mouse tissues: brain cortex (top-left), colon (top-center), small intestine (top-right), liver (bottom-left), prostate (bottom-center) and skeletal muscle (bottom-right) using GFAP (E4L7M) XP® Rabbit mAb. Immunohistochemical analysis of paraffin-embedded human cerebellum using GFAP (E4L7M) XP® Rabbit mAb. 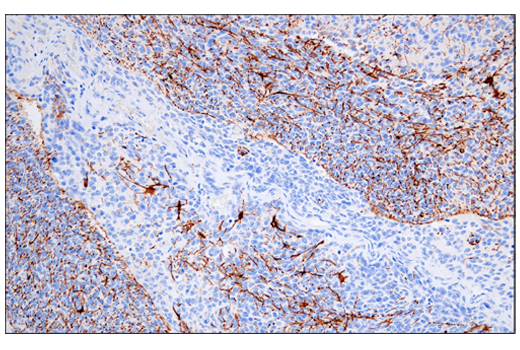 Immunohistochemical analysis of paraffin-embedded human glioblastoma using GFAP (E4L7M) XP® Rabbit mAb. 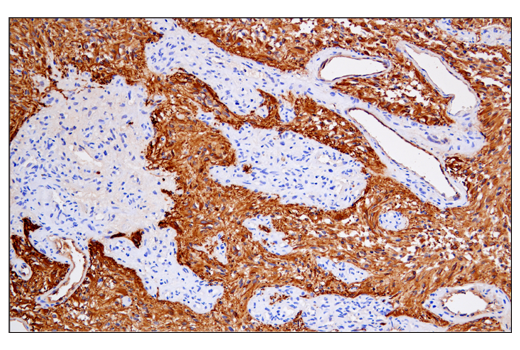 Immunohistochemical analysis of paraffin-embedded human medulloblastoma using GFAP (E4L7M) XP® Rabbit mAb. 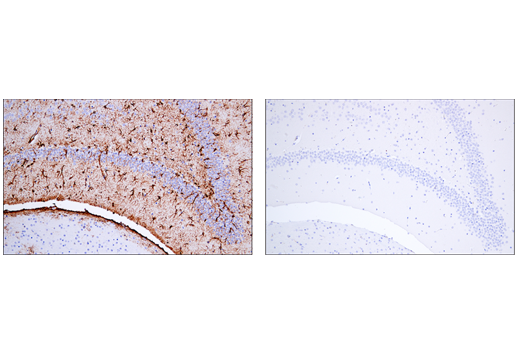 Immunohistochemical analysis of paraffin-embedded mouse hippocampus using GFAP (E4L7M) XP® Rabbit mAb (left) compared to concentration matched Rabbit (DA1E) mAb IgG XP® Isotype Control #3900 (right). 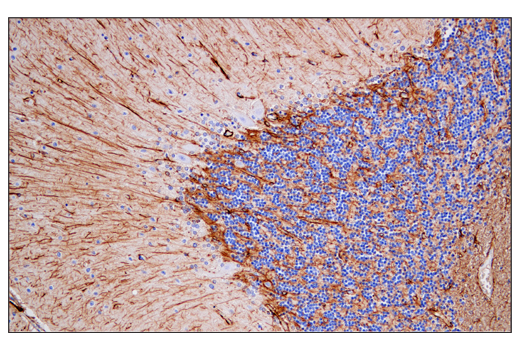 Immunohistochemical analysis of paraffin-embedded rat brain, cortex (left) and cerebellum (right), using GFAP (E4L7M) XP® Rabbit mAb. Confocal immunofluorescent analysis of adult mouse cerebellum (left) and hippocampus (right) using GFAP (E4L7M) XP® Rabbit mAb (green). 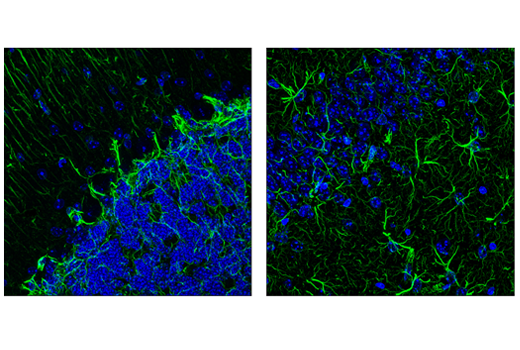 Samples were mounted in ProLong® Gold Antifade Reagent with DAPI #8961 (blue). 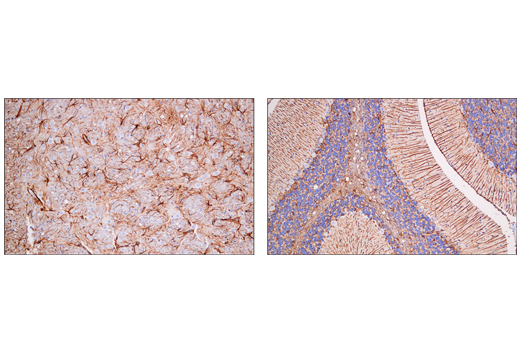 GFAP (E4L7M) XP® Rabbit mAb recognizes endogenous levels of total GFAP protein. Monoclonal antibody is produced by immunizing animals with recombinant protein specific to the amino terminus of human GFAP protein. The cytoskeleton consists of three types of cytosolic fibers: microfilaments (actin filaments), intermediate filaments, and microtubules. Major types of intermediate filaments are specifically expressed in particular cell types: cytokeratins in epithelial cells, glial fibrillary acidic protein (GFAP) in glial cells, desmin in skeletal, visceral, and certain vascular smooth muscle cells, vimentin in cells of mesenchymal origin, and neurofilaments in neurons. GFAP and vimentin form intermediate filaments in astroglial cells and modulate their motility and shape (1). In particular, vimentin filaments are present at early developmental stages, while GFAP filaments are characteristic of differentiated and mature brain astrocytes. Thus, GFAP is commonly used as a marker for intracranial and intraspinal tumors arising from astrocytes (2). In addition, GFAP intermediate filaments are also present in nonmyelin-forming Schwann cells in the peripheral nervous system (3). Jessen, K.R. et al. (1990) Development 109, 91-103.